St. John Mary Vianney was born at Dardilly, France, in 1786. He was a farm-hand until his nineteenth year, when he began his studies for the priesthood. His talents were poor, and his progress slow. He was ordained at Grenoble in 1815; he became parish priest of Ars in 1818. That little town was the scene of his marvelous labors until his holy death, August 4, 1859. He was canonized May 31, 1925, by Pope Plus XI. For forty years his food and sleep were insufficient to sustain human life; during the last ten years of his life he spent from sixteen to eighteen hours a day in the confessional. Enlightened by God, he could read hearts and soften the most hardened sinner. He healed the sick and cast out devils; like his Master he was openly persecuted, calumniated and hated by wicked men. His little parish attracted thousands of people. Towards the end of his life 158,000 people visited Ars in a single year. He founded an orphanage for girls, trusting its support to Divine Providence. He had the gift of prophecy, and told many souls what the future held in store for them. He is in a special manner the model for all parish priests. 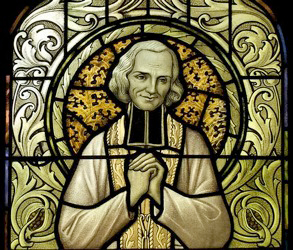 St John Vianney is patron of the Oratory of St John Vianney and model for priestly life and service of the Oratorians who keep their Patronal Feast today. Please remember to pray for the Oratorians who seek to emulate his spirituality and charism in their own pastoral ministry and priestly lives. Today is also the commemoration of The Vigil of St. Laurence and the feast of St. Romanus, Martyr. The vigil of St. Laurence has been observed in the Church certainly since the Fourth Century. The ancient vigils consisted of a fixed number of scriptural Lessons alternated with responsorial Psalms and episcopal Collects. When day began to break, the Holy Sacrifice was offered and the fast came to an end. 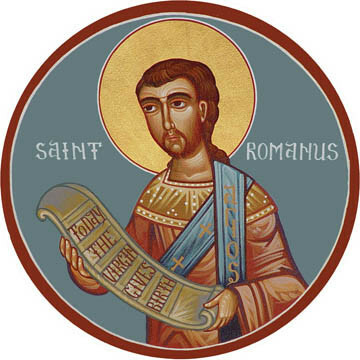 St. Romanus was a Roman soldier. He was converted to the Christian faith by the preaching of St. Laurence, and was beheaded the day preceding that of the saint’s martyrdom. Almighty and merciful God, Who by pastoral zeal, the yoke of prayer, and the ardor of penance hast made glorious St. John Mary; grant, we beseech Thee, that by his example and intercession we may be enabled to gain for Christ the souls of our brethren and with them attain to everlasting glory. Through our Lord Jesus Christ, Thy Son, Who liveth and reigneth with Thee in the unity of the Holy Ghost, God, Forever and ever. Attend, O Lord, to Our supplications, and by the intercession of Thy blessed martyr, Lawrence, whose feast we anticipate, graciously bestow upon us Thy everlasting mercy. Through our Lord Jesus Christ, Thy Son, Who liveth and reigneth with Thee in the unity of the Holy Ghost, one God Forever and ever. Grant, we beseech Thee, almighty God, that by the intercession of blessed Romanus, Thy martyr, we may be delivered from all adversity in body, and be purified from all evil thoughts in mind. Through our Lord Jesus Christ, Thy Son, Who liveth and reigneth with Thee in the unity of the Holy Ghost, one God Forever and ever. We offer Thee, O Lord, sacrifices of praise in commemoration of Thy saints,by whom we trust to be delivered from evils both present and future. Through our Lord Jesus Christ Thy Son our Lord, Who liveth and reigneth with Thee in the unity of the Holy Ghost, one God Forever and ever. Mercifully receive, O Lord, the sacrifices which we offer Thee, and by the intercession of blessed Lawrence, Thy martyr, loose the bonds of our sins. Through our Lord Jesus Christ, Thy Son, Who liveth and reigneth with Thee in the unity of the Holy Ghost, one God Forever and ever. We beseech Thee, O Lord, to receive our offerings and prayers; and by Thy Heavenly mysteries cleanse us and mercifully hear us. Through our Lord Jesus Christ, Thy Son, Who liveth and reigneth with Thee in the unity of the Holy Ghost, one God Forever and ever. We, Thy suppliants, who are refreshed with heavenly food and drink, beseech Thee, O our God, that we may be fortified by the prayers of him in whose commemoration we have partaken of these gifts. Through the Lord Jesus Christ, Thy Son, Who liveth and reigneth with Thee in the unity of the Holy Ghost, one God For ever and ever. Grant, we beseech Thee, O Lord, our God, that, as in commemorating blessed Lawrence, Thy martyr, we show our joy in a temporal duty, so we may be gladdened by beholding him in eternity. Through our Lord Jesus Christ, Thy Son, Who liveth and reigneth with Thee in the unity of the Holy Ghost, one God Forever and ever. Let us pray. We beseech Thee, almighty God, that we who have partaken of the food of Heaven may, by the intercession of blessed Romanus, Thy martyr, be strengthened by it against all harm. Through our Lord Jesus Christ, Thy Son, Who liveth and reigneth with Thee in the unity of the Holy Ghost, one God Forever and ever.